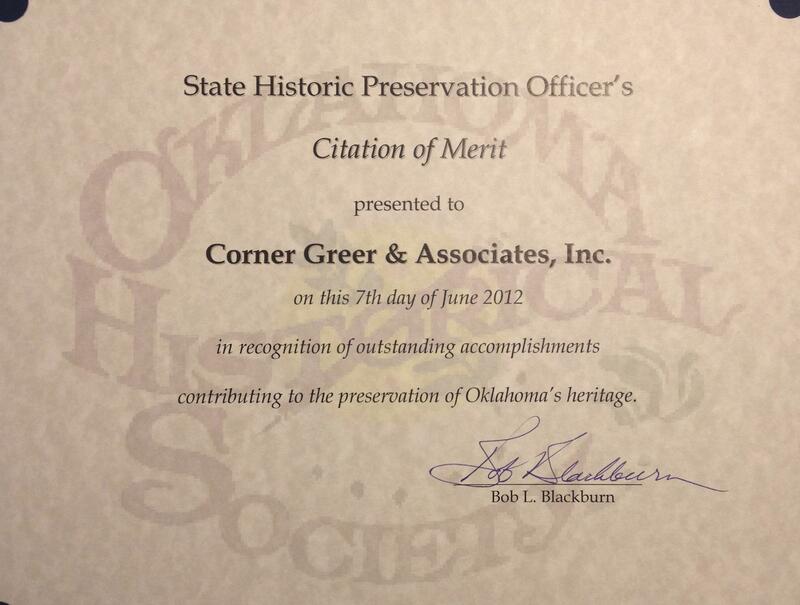 The Oklahoma Historical Society's State Historic Preservation Office annually presents its Citation of Merit to government agencies, organizations, firms, and individuals who have had positive impacts on the preservation of Oklahoma's significant historic properties. Accomplishments in archeological site preservation, research, publication, public programming, leadership, adn restoration/rehabilitiation work are recognized. The 2012 recipients were honored during the statewide preservation conference awards banquet in Tahlequah on June 7. Corner Greer & Associates, Inc was recognized for the Rawlins Furniture Company Building Rehabilitation Project.